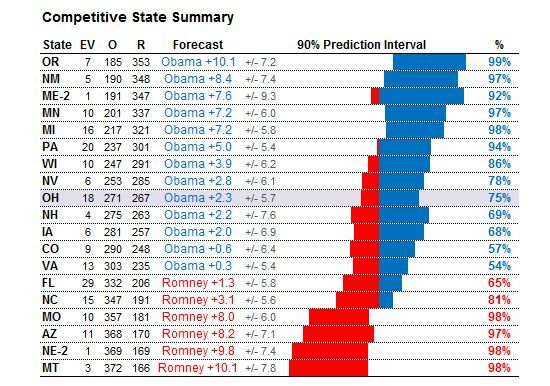 As you can see from the chart, Silver estimates that Obama has a better than 90% chance of winning OR, NM, MN, and PA. Those states would give him 237 electoral votes. Obama has a better than 80% chance of carrying WI and reaching 247 electoral votes, just 23 votes short of the magical 270 he needs to win. NV and OH would insure Obama’s re-election and Silver projects he has a 75% or better chance of carrying those states. In summary, Ohio continues to be a key state that could give the win to Obama even if he loses FL, VA, NH, CO, IA. Let’s hope Silver is right.